Kate and Neil had a biomass boiler installed into their garage by Highland Wood Energy (Torlundy), to run a new central heating system. The original part of the house dates back to when they were built with one metre thick granite walls, and actually started out its life as a stable. It was added on to prior to 2001, with a small extension that now serves as a study, a larger extension that now forms the main part of the house and double glazing was installed throughout. Up until recently, heating and also to hot water were provided by white meter electricity, with four storage heaters that were in various stages of disrepair. The open fire in the living room does not have a back boiler; therefore an immersion heater was used to top up the hot water when required. Without being able to insulate the stone walls, the kitchen was very cold and Kate was used to walking around dressed in a blanket to try and keep warm. Kate and Neil had been thinking about installing a central heating system since they moved in to the house three and a half years ago. The news that a baby was due to arrive at the beginning of August this year sparked them into action, and they had a long think about what means would be appropriate. Oil and calor gas were ruled out because long term, prices can only go up. However, Kate really wanted to do something more sustainable and for a while a ground source heat pump was considered. However, Kate then recalled an open day some years ago at the Glencoe Visitor Centre where a biomass boiler had been installed. A quick google search brought up Highland Wood Energy as a accredited supplier and installer of biomass boilers and as the company is locally based, Kate and Neil decided on this preferred option. 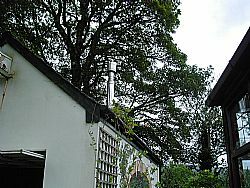 As losing the open fire was not an option they wanted to consider, Kate and Neil decided to install a 23 kW LP20 boiler in the garage. At 90% efficiency this will run nine radiators and two towel rails. It runs on wood pellets that at the moment are being collected from HWE in Torlundy (HWE can deliver pellets at a small additional charge if you cannot collect). Plumbing the house was a slight problem due to the thickness of the walls, however this was always going to be the case whatever central heating system was chosen. The boiler was commissioned at the beginning of July and the 30% Energy Saving Trust grant cheque was gratefully received to assist the initial finance costs. 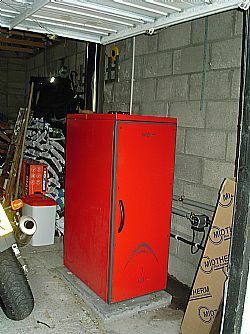 This installation pre-dated the current RHI payments and other schemes.